If you want a firearm that has been around for years and years and has proven itself under a plethora of conditions, then the 12 gauge is for you! The 12 gauge shotgun is a phenomenal firearm that has been used by militaries, law enforcement agencies, and civilians alike to be powerful and effective for many different shooting applications, such as self defense, hunting and sports shooting. Winchester has been around since 1866, creating high quality firearms and ammunition that the American people use and trust. 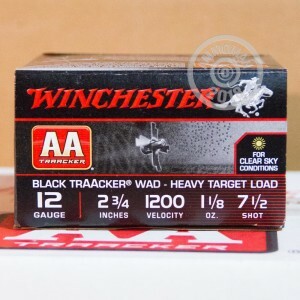 These Winchester Target Black TrAAcker heavy load shells are designed to be shot on clear sky, sunny days so you can see where the black wad flies against the blue sky. Each hull in this box of 25 measures 2-3/4" in length and carries a 1-1/8 oz. payload of #7.5 lead shot. 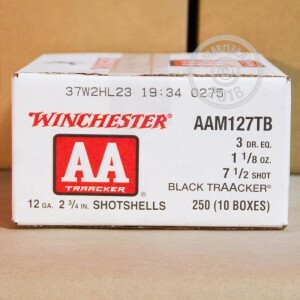 These are perfect shells for target shooting and small game hunting. Stock up and save! At AmmoMan.com all orders over $99 receive Free Shipping!